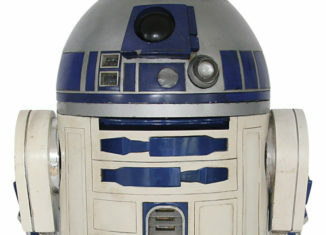 An R2-D2 droid used in several 'Star Wars' films sold at auction for nearly $3 million. It's considered the most expensive item offered in a movie memorabilia auction. No surprise since the piece is from one of the most popular and lucrative movie franchises ever. The auction house "Profiles in History" says the 43-inch tall unit was cobbled together from parts used in the original trilogy. No word on who bought it. Other big-ticket 'Star Wars' items sold included a Luke Skywalker lightsaber, fetched $450,000 and Darth Vader's helmet from the original flick sold for $96,000.